A consultation meeting was held on problems and prospective of senior citizen in Arunachal Pradesh here at Hotel PYBSS conference hall on Saturday. Advisor to chief minister Tai Tagak, Help Age India (HAI) state head programme-Northeast Nilondra Tanya, Secretary Social Justice & Empowerment Madhu K. Garg (IAS) with Social Justice & Empowerment Director Yumlam Kahaspoke were on the occasion. Nilondra Tanya in his address tinted the various programmes and activities lead by HAI all around the country. He talked about the need of special care for the senior citizen in the state. Except Arunachal Pradesh and Meghalaya all the other sister state has adopted old age association. The need of Old Age Association is very needed as the state is taking a new route and adoption of western culture and modernization. We are in a society where yet there is no Nuclear family but the days are not far when youths will soon will adapt to it. So before its too late we should bring a policy to take care of age old citizen in the state, Nilondra added. Madhu K. Garg, (IAS) giving her conscience on old age citizen in the state told that, “The state has already adopted old age help for the citizen in the year 2012.” But what we really need today is old age home for the destitute. We have also increased the old age pension from Rupees 1300 to 1500 with the help of state government, she said. The society and family here at Arunachal is far better than what we see in Delhi, where we always come over old age family problems. We are right now working on two sets of old age plan with the state government and soon will be disclosed, she added. The state is all dependent on centre without own resource thus much can’t be done to bring up such issues in large, she told. In the meantime she also gave little advice on making life healthy and happy of the age old people. Meanwhile Tai Tagak listening to all the aspects old age pension and home said that, there will be hurdle at the beginning in any work but we can do it. The state government led by chief minister Pema Khandu is all set for greater interest of the people. Our people are effortlessly adapted to modernization thus we really need age old homes for senior citizen. No doubt there is problem of state own income but problems brings opportunities and I will surely convey these issue to the chief minister, Tagak said. 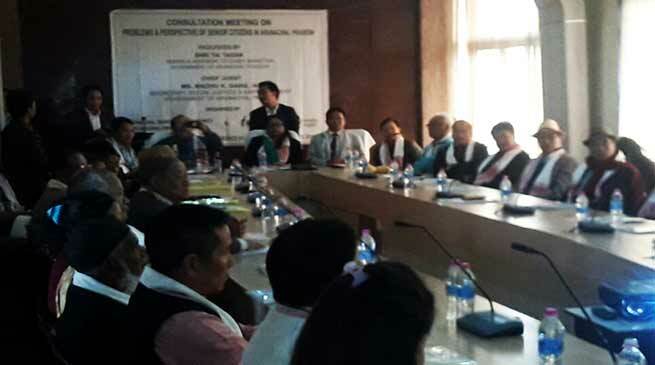 A new State committee was constituted to take over the HAI which include President Epa Tana Tara; Vice Presidents Dr. Bengia Tubin, General Secretary Bengia Augung along with other core members.